This is a few notes and pictures about my collection of vintage MicroBee gear, which includes a working example of the extremly rare 'Gamma' 68000 based microbee. After being contacted by one of the people behind www.thepcmuseum.com about any information I might have that could be used to revive their non functional Gamma machine, I decided to drag mine out of storage and see if it still booted. It did much to my surprise. I have a functioning machine for the simple reason of being in the right place at the right time at the Gosford factory when they were 'cleaning up' and were going to throw the machine out. 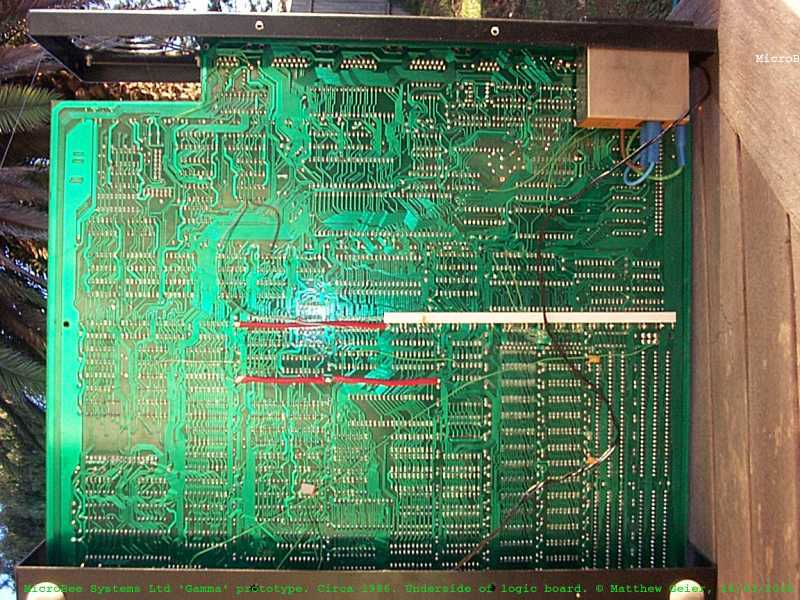 I do not remember the year or date, but it was before the great 'North Ryde MicroBee FireSale', at which a large number of blank Gamma circuit boards were disposed of along with the non functional remains of engineering prototype Gamma machines. Many 'bee fans left that sale with asperations of being able to turn those boards and partially gutted prototypes into working machines. My particular machine appears to be from a batch of 'pre-production' prototypes that were built for trade show demo's and to be sent to developers. (The logic board is green!). 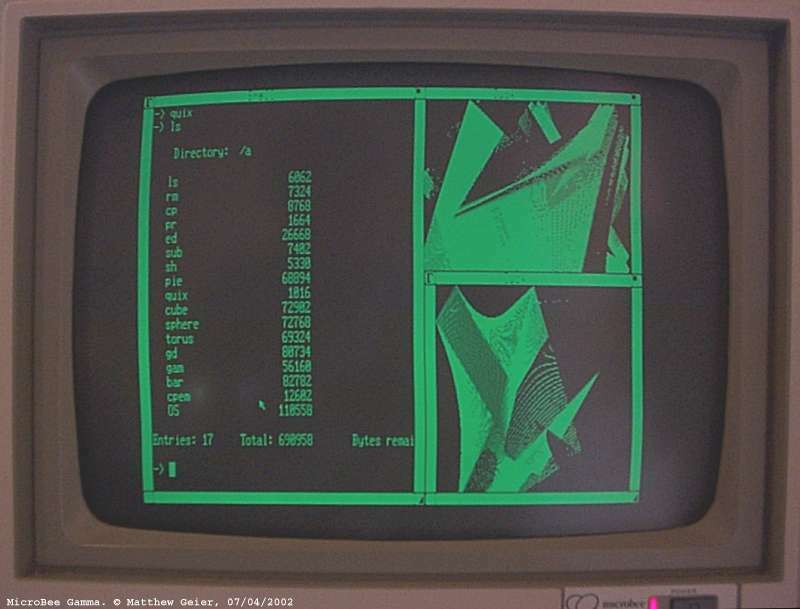 My machine may also be incapable of running a colour monitor, it appears the video out has been modified to drive the M18 (18Khz) monochrome monitor. The operating system on my machine is NOT Unix. A number of articles published by various writers before the machine was finally abandoned said it ran Unix. 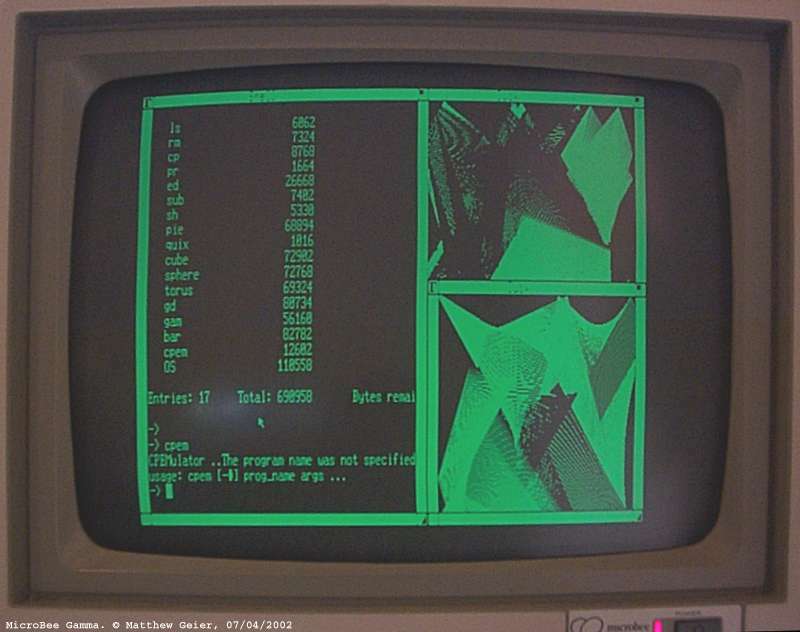 (See The Unamed Computer Museum's Gamma section for scans of various magazine articles). This is not true. It was Unix like. Vaguely. These days people would laugh that such a basic OS could be called Unix like, its shell doesn't even support I/O redirection!. 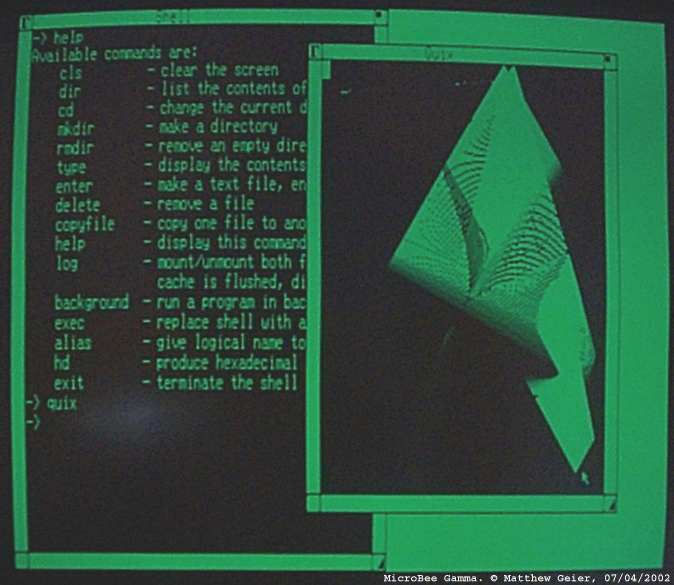 It did borrow a few ideas that were the domain of Unix at the time - Pre-emptive multitasking , a true hierarchical file system and the concept of 'device as a file' represented as a virtual /dev. By this time HFS was available on Macintosh systems, and the Apple Lisa had also implemented similar powerful operating system concepts. In many ways Apple went backwards in a massive way with the Macintosh!. (I've got a Lisa some where as well, sadly its power supply has died and the hard-disk controller was damaged by rodents). 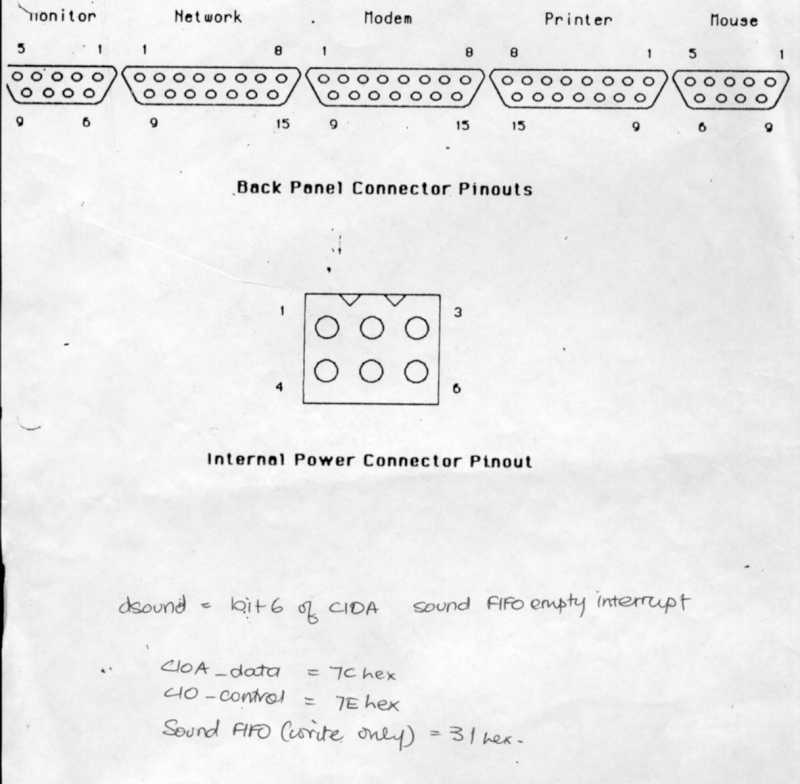 A friend some years later managed to obtain circuit diagrams and some additional software (Demo source code, 128k CPM-80). 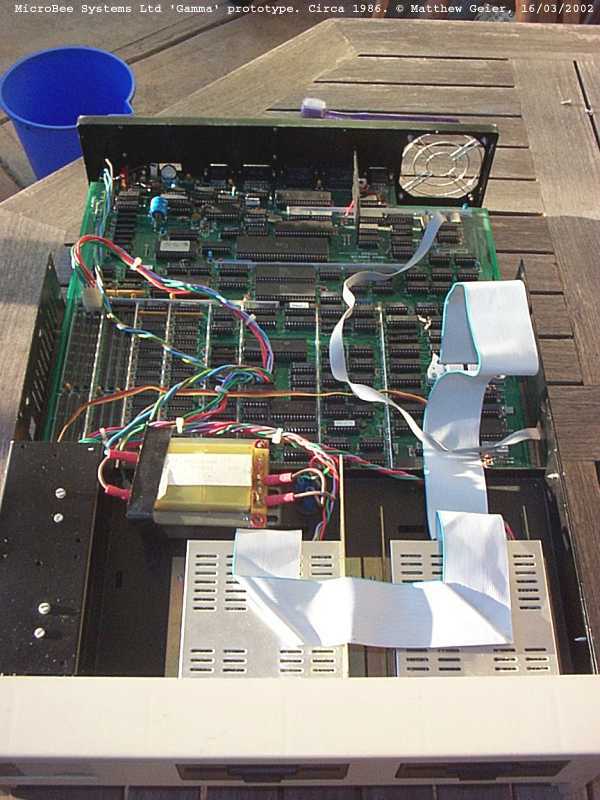 He subsquently found that the circuit diagram did not match the blank 'green' production logic boards that were sold at the North Ryde sale, and that the 'patches' on my functional machine were different on those of a dead engineering prototype he had managed to aquire. It is possible that no accurate information about how to build one of these machines still exists. I would like to put disk images and those drawings online, but I belive there would be copyright and I.P. issues involved. 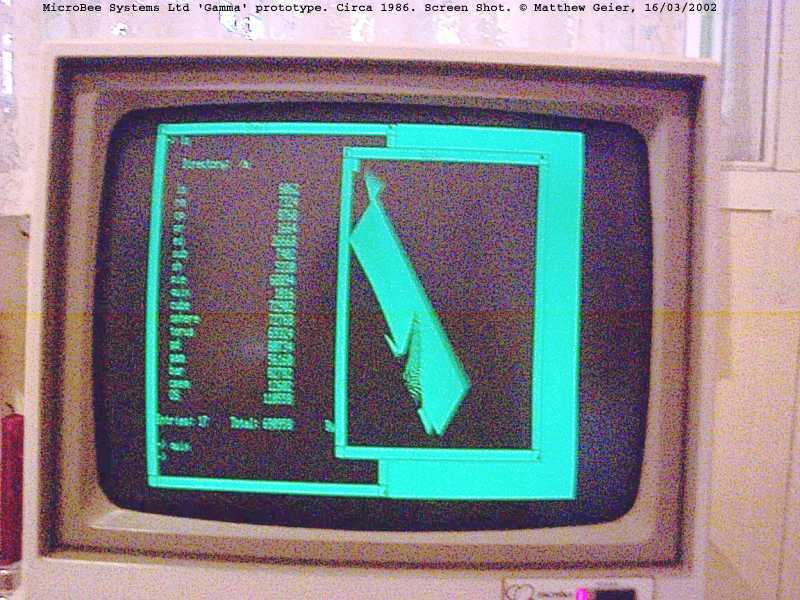 The machine may be a 10 year old failed prototype from a failed company, but the drawings and software were by no means ever released to the public domain. Some I've been in contact with, contacted Owen Hill, the orginal Mr MicroBee. Owen appears to be of the opinion, after 10 or so years 'who cares'. Rumour has it that the Gamma killed Microbee Systems. It certainly contributed - 4 years of R&D abandoned, but other things like having a warehouse full of 'MicroBee Delta' casings and 18Khz M18 monitors that were incompatable with the Z80 based 'bees didn't help either. (The Casing designed for the 'Delta' eventually got used for the final 'true' 'bee variant, the 256TC). As far as I am aware, the 'Delta' microbee never made it out of the CAD system, except for its very expensive casing. 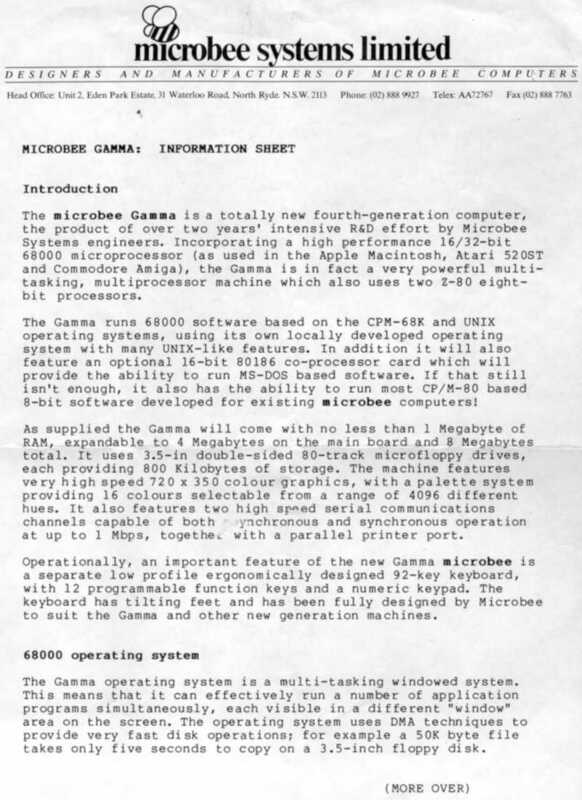 Last heard about the Gamma before the project was abandoned was an attempt to get it to run MS-DOS on a 8088 CPU daughtercard. The company by that time at lost it's way. The Amiga's were cheaper and had a more functional Operating System and the computer market was well on its way to the 'WinTel' dominance we see today. 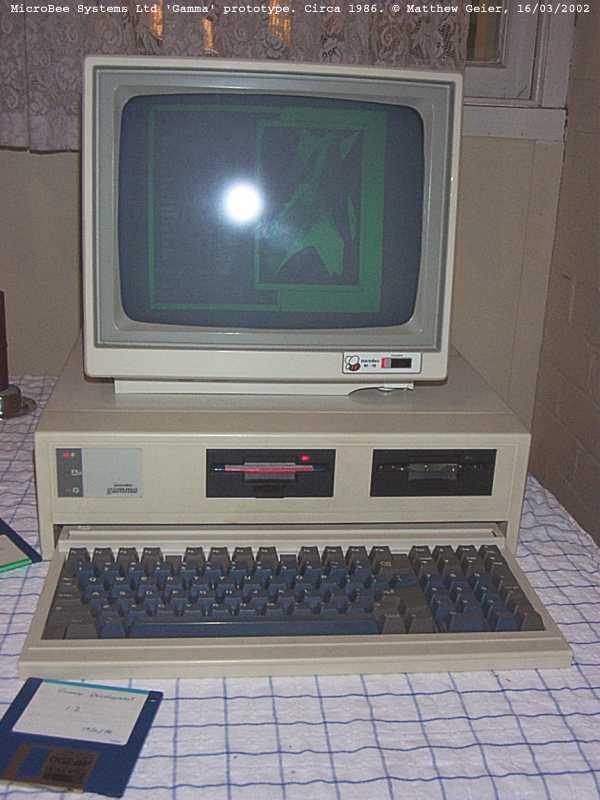 I along with a number of other 'bee owners then bought into another computer, the Applix 1616 , a kit computer that made it debut as Electronics Today International's project 1616, at a time many 'bee owners were wondering what to do now the Gamma was offically dead. Many of the parts that went into my 1616 were a 21st birthday present!. The 1616 story is online as told by its designer. The 'network' port is used to support a 'standard' two button MicroSoft protocol mouse. The only documentation for the machine I have is how to wire this up. I recently found a 'bus' mouse off a Tektronix XD88 unix workstation would move the mouse pointer (with XY swapped) when it was plugged into the mouse port. With out the port pinout I am unable to get the buttons to work on this mouse. (I then found the serial adapter and an MS mouse). The disk format 5 x 1k sectors, the same as the Applix 1616, which I used to duplicate the system disks years ago - the Gamma I have is incapable of formatting floppy disks - I don't know if this is a hardware fault or broken software. I recently got my Linux 'WinTel' machine to read this format and duplicate a disk. 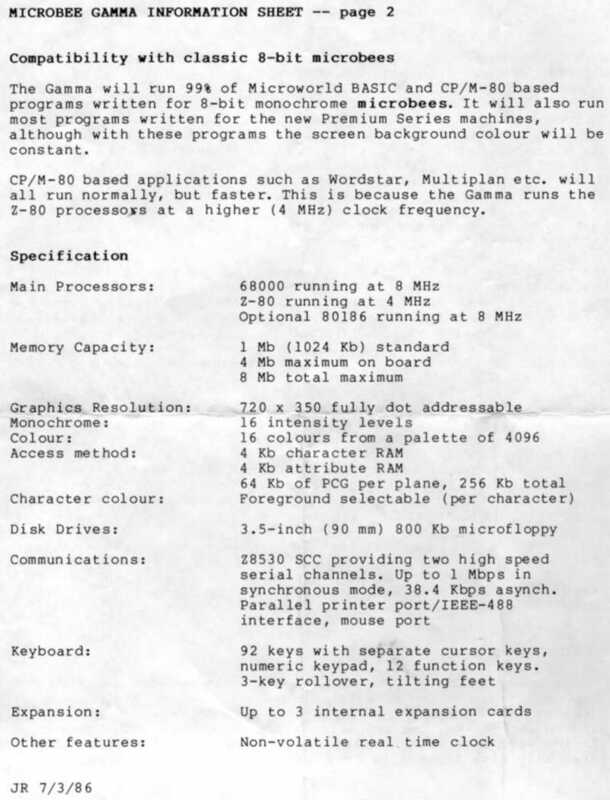 The CP/M disk format is microbee standard, 10 x 512 byte sectors, which I am having trouble imaging under Linux. Gamma OS cannot read the CP/M disk format. 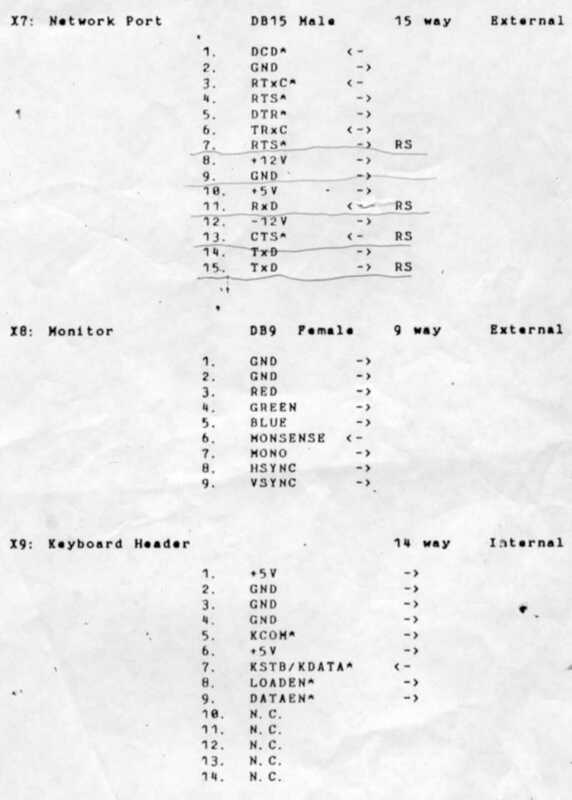 The CP/M system also CAN NOT run many 8 bit microbee programs, they either abort with BIOS error messages or crash (I assume looking for a 6845 'light pen' microbee keyboard). The advertising always claimed it would. The hardware in the Gamma was quite programmable, so possibly the released OS would take care of this compatablity problem.